More Hachimaki designs including a 'Kamikaze (Divine Wind) Wasabi' and and 'Ichi-ban high score Sushi'. Aarrgh! Converting the high score banner to a Hachimaki is looking good too - what to do! A selection of designs for the Sumo! 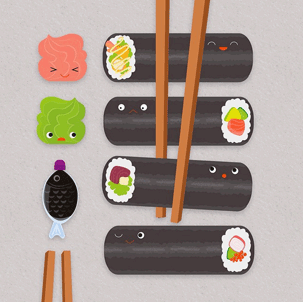 App, a high score banner to sit on top of a sushi. The red square indicates the chosen design. Another character is completed - thanks Terri. ..and here are some coloured designs underway.